One of the founding fathers of the “anime” genre, Speed Racer receives a 21st century make over thanks to the Wachowski Brothers who are the ones responsible for the epic Matrix series. 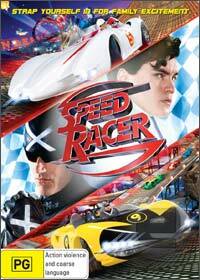 For Speed Racer, it receives a similar high speed and strange tale about a young racer played by the delightful Emile Hirsch who is part of the Racer family and vows to become the world’s best racer. Speed Racer is joined by genius grandfather Pops who is played perfectly by John Goodman and his older brother Rex who is also a world class racer. Unfortunately for Rex, he is killed in a race when he joins the corporate world of racing that his grandfather shunned and for Speed, he has some big boots to fill, especially when villains are around every corner and the mysterious Racer X is subtly looking out for Speed. Although the story is quite clichéd, what sets this movie apart from the current world of racing movies is the adrenaline pumping special effects that almost makes this movie look like it’s on speed (pun intended). With outrageous special effects that at times looks like it has been taken directly from a video game, it’s difficult not to find this movie so appealing, especially with some of the overacting of the “villain” Royalton that also sets this movie up for a sequel. Although aimed at the younger viewer, Speed Racer the Movie has enough content to keep more mature viewers entertained that looks simply amazing on DVD, however if you have Blu-Ray, than this is definitely a reference title to own.